January 18, 2009 | HYRUM -- A Saturday at the beach sounds pretty nice. But when it takes four chainsaws to break the ice to get to the water, some may have second thoughts. The Polar Plunge to benefit Special Olympics Utah took place Friday and Saturday at Hyrum dam. 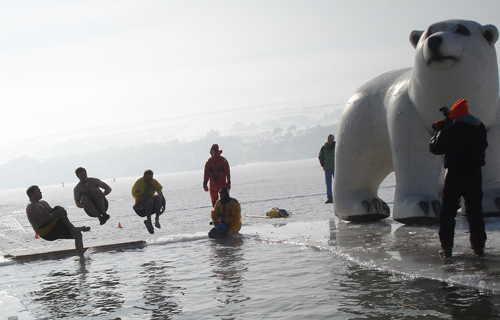 Temperatures were in the high teens as participants plunged into the ice-cold water. With a slight breeze in the air, fog and ice fishermen in the background, it seemed an unlikely day to take a dip. The Special Olympic athlete oath -- "Let me win. But if I cannot win, let me be brave in the attempt" -- seemed appropriate as plungers braved the elements. Some teams, such as the Cache Valley Specialty Hospital and the Arctic Angels, wore costumes. Others wore very little. Teams included local law enforcement, students from Mountain Crest and Sky View high schools, and employees from Angie's and America First Credit Union. Most plungers jumped in feet first. Other plunges included the cannon ball, the somersault in the air and the much-loved belly flop. That feat drew a lot of noise from the crowd. "That's gonna leave a mark!" said one spectator, after a plunger smacked the top of the water with his belly. At noon Friday, 16 Cache County deputies and law enforcement officers began the Super Plunge relay. These two groups had one team member jump every hour, on the hour, for 24 hours. The two Super Plunge teams raised more than $8,800. "Last year I did 24 jumps, this year I only did five," said Deputy Misty Garn, a Super Plunge team member. "This year was much better." Garn, who was also team captain of Cache County Cops Keepin' it Cool, had gone 30 hours with no sleep. To prepare, she said she ate a lot of junk food and drank lots of Mountain Dew. Garn has been with the sheriff's office for five years and supervised Special Olympics fundraising for the sheriff's office just over a year. The combined law enforcement officers for Cache County raised more than $20,000 for the cause in 2008. The 2009 goal is $25,000. Garn hopes the Polar Plunge alone will bring in $20,000. "It's fun. We come out here and have a really good time," said Garn. Justin Hedstrom of Hyrum and Gregory Short of Logan were also among the participants who helped raise money for SOUT. Justin jumped last year and was an experienced plunger. Gregory, on the other hand, was not. "Yeah, like 10 times!" teased Justin. "I'm not a fan of the cold," explained Gregory. Justin seemed to understand Gregory's hesitancy to plunge. He was also scared his first year and almost wimped out. Justin was quick to point out that Gregory was the first to plunge out of their group of three, which included Zac Zimmerman. Before jumping, Justin thought, "How cold is it going to be? Am I going to make it out alive?" As for Gregory, he thought, "I'm so stupid!" Forty minutes after the plunge, their feet and hands still hurt. They expected the pain to go away in another 30 minutes. Despite this, both said they were glad to do it. "It was a lot of fun," said Gregory. "It was for a good cause," added Justin. "It's pretty much like you're going in a swimming pool, just that it's 15 degrees," said Gregory, as Justin laughed. When asked if they would do it again, Justin said yes and Gregory said probably not, but then said Justin would probably drag him into it again. Justin registered Gregory Friday night. They hope to get a larger group together next year. "It was a big adrenalin rush," said Justin. Besides the adrenalin rush, there was also a sense of accomplishing something good. According to the Special Olympics Utah Web site, "Special Olympics is an unprecedented global movement which, through quality sports training and competition, improves the lives of people with intellectual disabilities and, in turn, the lives of everyone they touch." The Polar Plunge was one small way to give back to a great organization and its even greater athletes.